Posted on July 21, 2016 at 4:47 pm. INDIA is the last place you would think of as a gambling destination, but if you are looking for something unique it might be for you. While very few states in India have legalised gambling, Goa is one out of the box, with its unique floating casinos. Situated on the Mandovi River, the floating casinos pale in comparison to the bright lights of Las Vegas, Macau or even Ausralian casinos like Crown Casino, Melbourne, but they definitely have their charms. Goa is a popular tourist destination for backpackers and adventure-seekers and is one of the places with the highest standard of living in India, with a thriving economy. But the floating casinos have come under fire in recent times, despite being a unique attraction some factions of the public want them moved or closed down. The government recently renewed their licence for another year, on the condition they find a new home away from where they are currently situated. Several options have emerged, including a pitch by Gayatriraje Chowgule, of the Chowgule Group, which would see the floating casinos moved to a “special offshore casino zone”. Chowgule said the zone as about 3km from the Dabolim International Airport, but no formal reply had come from the government in response to their offer. These types of changes in India traditionally take a long time, if they ever happen, so gamblers travelling in India in the foreseeable future will be able to play at the casinos at their existing location. 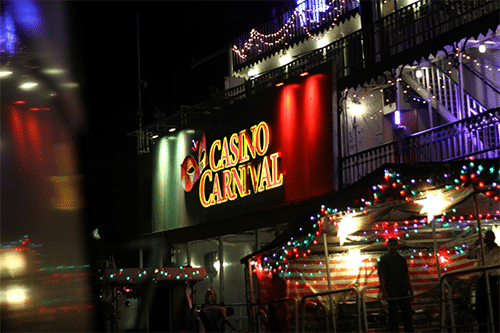 Arguably the best of the floating casinos is Casino Carnival, which has games like roulette, baccarat, blackjack and poker variants. The table limits on some of the main card games range up to AUD $4,000. The casinos also feature a range of slots games which have a unique Indian twist. Australians can travel to Goa via Mumbai and New Delhi with many major airlines having flights to these hubs, or play at home at the many offshore online casinos accepting AU players. Players from United States are still welcome at Raging Bull Casino, which offers a large range of exciting casino game variants from several leading software developers.